The arrival of spring doesn’t just mean that more sunshine and warmer weather is on the way; it also marks the beginning the tick season. Few things are as bothersome or unnerving when you are trying to relax and enjoy the beautiful weather as finding a tick that has latched onto your skin. Ticks are one of the most widely despised and feared insects, and it isn’t just because they seem to be an ever-present nuisance. In order to survive and breed, ticks need humans or animals from whom they can extract blood, and because they can carry diseases that are easily transmittable to their hosts, one bite can result in serious health consequences such as Lyme Disease. The importance of tick control extends far beyond making your yard a more enjoyable and peaceful place to spend time. Minimizing exposure to ticks by eliminating their potential breeding grounds and habitats should be considered a top priority when it comes to ensuring that you and your loved ones are kept out of harm’s way. Despite their diminutive size and appearance, ticks are highly equipped to carry and transmit many serious diseases to their prey. Ticks are notorious for transmitting Lyme disease, which is an infection that, if not treated promptly, can cause major long-term health complications. Of all of the reported cases of vector-borne illnesses in the United States, Lyme disease is responsible for more than 95%of them—and Maine is one of the top 12 states with the highest number of victims. The number of people in Maine who become infected with Lyme disease is on the rise due to the increasing population of deer ticks throughout the state. Mild winters, like the one we just had, allow ticks to remain active during the months that they are typically dormant, and this is cause for concern for the Center for Disease Control (CDC). The number of ticks this summer is expected to be significantly higher than in years past, and this substantially increases the risk of humans and animals contracting Lyme disease. CDC records show that since the year 2000, the number of confirmed cases of Lyme disease in Maine has increased by over 1000% — a surge that is unrivaled by any other state in the country. In 2010, the number of confirmed and probable cases of Lyme disease was 752 — a number that experts expect will be surpassed this year. Ticks make their homes in long grasses and areas of land that are heavily-wooded and shady, so in order to limit tick encounters on your property, it is essential that you regularly mow and maintain your lawn. If you have a large yard that borders on woodlands, it is important to spend extra time making sure that the entire border is clear of weeds, brush and leaf litter that are ideal hiding spots for ticks. Not only are ticks a health risk for humans, but they can also transmit diseases to family pets. Like humans, pets can also get Lyme disease from ticks, and because their dense fur is capable of concealing these small bugs, they are much more susceptible to infection than we are. Preventing the tick population on your property from getting out of control is the key. That’s why it is recommended that you hire a professional such as Lucas Tree Experts who has the tools and expertise to tackle the situation effectively and rapidly before it becomes a problem. At the same time, it is important to understand that while you can substantially reduce the tick population on your property, it is unlikely to expect their total elimination, so it is still important to protect yourself. It is always a good idea to wearing clothing and footwear that protect as much of your skin as possible from potential hitchhiking ticks. With all of the effort that you put into maintaining your home and property, you should be able to enjoy all of it without worrying about pests getting in the way. Professional pest control is the most effective solution for solving your long-standing insect problems. Lucas Residential offers complete programs for both mosquito control and tick control that are tailored to your specific property needs, and our guaranteed rapid results will have you back outside in no time. When the weather is nice, you shouldn’t have to stay indoors in order to stay safe. If insects have taken control over your property, Lucas Tree Experts will solve the problem and put the control back where it belongs—in your hands. 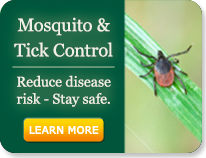 For more information about controlling or preventing tick infestation or mosquito problems, talk with a Lucas Tree Expert today.